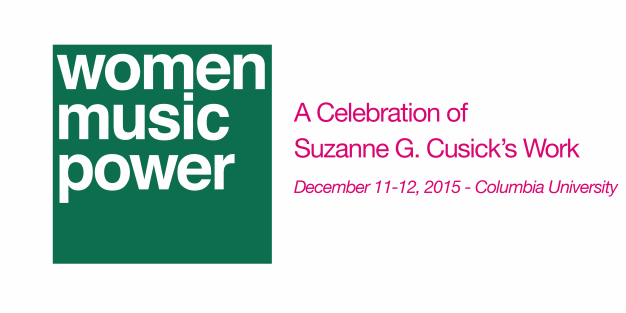 ​Women Music Power celebrates the work of Suzanne G. Cusick through a two-day symposium; a concert of new music; and the publication of a Festschrift volume in Prof. Cusick’s honor that will appear as volume 19 (2015) of Women and Music: A Journal of Gender and Culture, guest-edited by Emily Wilbourne. ﻿The symposium is free and open to the public. All sessions will take place at the Jerome Greene Annex at Columbia Law School (116th Street between Morningside and Amsterdam). The concert will take place at the Teatro of the Italian Academy for Advanced Studies at Columbia University (Amsterdam Avenue at 117th Street). The symposium is accompanied by a special concert featuring the International Contemporary Ensemble (ICE) presenting new works by a cast of international composers, each with ties to Columbia University or New York University: Zosha Di Castri and David Adamcyk, Maria Stankova, and Natacha Diels. The concert will be held in the Teatro of the Italian Academy at Columbia University. The Women and Music special issue will be launched at the symposium. The volume comprises nineteen articles and a text piece inspired by Cusick’s work, as well as an introductory essay by Emily Wilbourne. Article topics include female performers and songwriters from a wide swath of historical time, queer readings of music and of historical narratives, the voice, sexual and musical violence, and historiographical writing on embodiment, musicology, Jazz studies and ethnomusicology, with contributions from Amy Brosius, Annamaria Cecconi, Ryan Dohoney, Melina Esse, Kimberly Francis, Bonnie Gordon, Elizabeth Hoffman, Tomie Hahn, Nicol Hammond, Nadine Hubbs, Jenny Olivia Johnson, Elizabeth K. Keenan, Clara Hunter Latham, Maureen Mahon, Melanie L. Marshall, Jessica A. Schwartz, Tes Slominski, Judy Tsou, Sherrie Tucker, Holly Watkins, Deborah Wong, and Marìa Edurne Zuazu. Last but not least, an exhibit focusing on Cusick's work, the Women and Music journal, and the twenty-five year history of the biannual Feminist Theory and Music conferences will be installed at the in the Gabe M. Wiener Music Library, Dodge Hall, Columbia University between December 7 2015 and January 29, 2016. The exhibition is curated by Velia Ivanova and Jane Forner, Columbia graduate students in Historical Musicology. Women Music Power is organized by the Department of Music and Institute for Research on Women, Gender, and Sexuality at Columbia University, and is co-sponsored by the Department of Music and Dean for Humanities at New York University's Faculty of Arts & Science; Center for Ethnomusicology, Center for Science & Society, Center for Gender and Sexuality Law, Columbia University Libraries, Department of Philosophy, Department of Anthropology, the Fritz Reiner Fund, The Heyman Center and the Society of Fellows in the Humanities, Institute for Comparative Literature and Society, Institute for Research in African-American Studies, and the Music Performance Program at Columbia University; and the Canada Council for the Arts, Fonds de Recherche du Québec - Société et Culture, Women & Music: A Journal of Gender and Culture, and the Frederick P. Rose and Sandra P. Rose Foundation. Suzanne G. Cusick, Professor of Music on the Faculty of Arts & Science at New York University, has published extensively on gender and sexuality in relation to the musical cultures of early modern Italy and of contemporary North America. Her book, Francesca Caccini at the Medici Court: Music and the Circulation of Power (Chicago, 2009), received the “Best Book” award of the Society for the Study of Early Modern Women. Her articles appear in several of the most influential edited collections of the last thirty years, not least Musicology and Difference, Queering the Pitch, Rethinking Music, Audible Traces, and Rethinking Difference, and in journals including the Journal of the American Musicological Society, Early Music, Musical Quarterly, Perspectives of New Music, repercussions, Il saggiatore musicale, TRANS, radical musicology, and Women and Music. Her work has been translated into French, German, Dutch, Finnish, Italian, and Portuguese. Cusick's scholarly work has been supported by grants from the National Endowment for the Humanities and the American Council of Learned Societies, and she has been a Fellow at both Villa I Tatti, the Harvard Center for Italian Renaissance Studies, and at Harvard's Charles Warren Center for Studies in American History. She has won university-wide prizes for excellent undergraduate teaching at both the University of Virginia (1995) and NYU (2011). From 2005 to 2013 Cusick was the Editor in Chief of Women and Music: A Journal of Gender and Culture, the first—and still the only— English-language journal focused on the relationship of gender and sexuality to musical culture. She is currently co-editor (with ethnomusicologist Henry Spiller) of the series New Perspectives on Gender and Music published by the University of Illinois Press. In 2014, she was elected an Honorary Member of the American Musicological Society. Recent projects include the use of noise, music and “gender coercion” in the detention and interrogation of prisoners held during the 21st-century's “war on terror,” work for which she received the Philip Brett Award given by the LGBTQ Study Group of the American Musicological Society in 2007, and, with the help of an ACLS fellowship, she is currently working towards a new book, Men Hearing Women in Medicean Florence: An Acoustemology. Women and Music: A Journal of Gender and Culture is an annual journal of scholarship about women, music, and culture, is published for the International Alliance for Women in Music (IAWM) by the University of Nebraska Press. Drawing on a wide range of disciplines and approaches, the refereed journal seeks to further the understanding of the relationships among gender, music, and culture, with special attention being given to the concerns of women. Ellie Hisama, Symposium Organizer and Editor in Chief, Women & Music. Ellie Hisama is a Professor of Music at Columbia University and the current Editor-in-Chief of Women and Music: A Journal of Gender and Culture. She has also edited the Journal of the Society for American Music, for which she was Founding Editor, and Perspectives of New Music as an Associate Editor. Her professional interests include 20th- and 21st-century music, American music, popular music, gender and feminist studies, critical studies of music, race and ethnicity, and the social and political roles of music. She earned her Ph.D. in music theory at the City University of New York, studying with Carl Schachter and Joseph Straus. She is a past director of the H. Wiley Hitchcock Institute for Studies in American Music at Brooklyn College. Hisama has previously taught at Harvard University, the Graduate Center of the City University of New York, Connecticut College, Ohio State University, and the University of Virginia. She is the author of Gendering Musical Modernism: The Music of Ruth Crawford, Marion Bauer, and Miriam Gideon and co-editor of Ruth Crawford Seeger's Worlds: Innovation and Tradition in Twentieth-Century American Music. She has received fellowships from the Woodrow Wilson National Fellowship Foundation/Andrew Mellon Foundation and the Ethyle R. Wolfe Institute for the Humanities, and is a member of the Governing Board of Columbia University’s Society of Fellows. Lucie Vágnerová, Symposium Coordinator and Assistant Editor, Women and Music. Lucie Vágnerová is a Ph.D. candidate in Historical Musicology at Columbia University. Born and raised in Prague, Czech Republic, she holds a Bachelor of Arts in Music from the University of Nottingham and a Master of Arts degree from Columbia. She is broadly interested in critical theory, feminist musicology, the social life of technologies, and the intersection of commercial and listening practice. Her dissertation, titled Sirens, Cyborgs: Sound Technologies and the Musical Body, explores the political stakes of performance with technologies that push on the discursive boundaries of the body, such as vocal filters, technologies of acousmatic address, gesture controllers, and other wearables. Vágnerova has taught Music Humanities, Critical Approaches to Music Technologies, and Sexing Sound Art at Columbia. She chaired the 2014 Columbia Music Scholarship Conference, and she is a member of the editorial board of Current Musicology and the Assistant Editor of Women & Music. Zosha Di Castri, Concert Coordinator. See bio on Concert page.